we've gotten used to living in the same woods by now. but we still take note of each other and greet each other with ears flopping (they're good at that, i'm still practicing) and a soft "guten morgen!" (i'm convinced all animals secretly speak german too). joining soulemama with a favourite moment of this week, just can't help but add a few words to share along with it. have a great weekend! Hi Simone...you captured a beautiful moment. I've been reading The Poisonwood Bible by Barbara Kingsolver and she describes a really similar moment on the 2nd or 3rd page between one of the characters and a little okapi in the middle of a jungle. They both lock eyes for one special moment. This little deer is so pretty. We sometimes get little deers coming into our garden but they are monkjack ones and nothing like as pretty... I still love them though. That is one great moment..we see them on our walks in the national parks here, we say hi, don't mind us, just passing through, since they live there and we don't... lovely. Lovely shot! We have deer who come through our yard as well, but I've never seen one so close and personal. How innocent the little one is! Isn't he just beautiful! We have white tail deer here that I love to see. Have a wonderful weekend. beautiful! what a great capture. we live out in the country and get our fair share of visitors- but I've never been able to snap a photo in fear that they will run off if I move. This gave me chills! Wonderful shot! Thank you for visiting my moment! This is such a precious moment that you have here. I can just imagine what it must have felt like to be able to look into those beautiful eyes! Great photo! Our moment comes from our trip to the farm to get our weekly CSA and flower share. Our weekly flower share lead to some fun with math (sorting, counting, etc)! 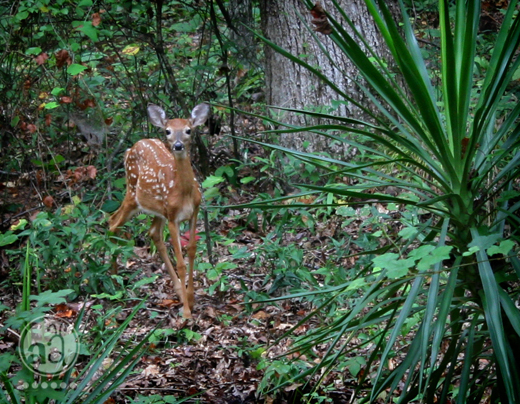 Oh my goodness, that's such a cute little deer! You must feel like Snow White walking through the forest! Wow! What an amazing shot! I don't need to tell you what an amazing photo this is! WOW!!! I haven't seen one for over 6 years now! Thank you! :) Great job!